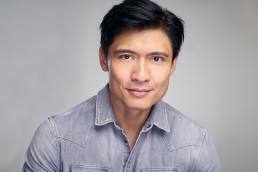 Paolo Montalban (born May 21, 1973) is a Filipino-American actor and singer best known for his performance in the 1997 Disney television film, Rodgers & Hammerstein’s Cinderella as Prince Christopher, opposite Brandy as Cinderella. He reprised that role in a stage version of the musical (see Cinderella) with Deborah Gibson and then Jamie-Lynn Sigler. 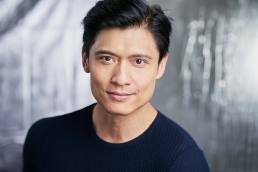 We had the pleasure of having Paolo Montalban at our studio to shoot his new headshots and find out more about his past and upcoming projects this year. I realized I wanted to be an actor my final semester in Rutgers University. A New York City agent saw a musical I was in at school and approached me afterwards and asked if I was interested in a career in acting. It’s weird to say it, but I guess I was “discovered”. Thank God I was lucky enough to keep working as soon as I started. Otherwise, I probably would have been a pediatric cardiologist who sings over little baby hearts. Stage or screen, what do you prefer? I enjoy the preserved for posterity and “it takes a small village” collaborative quality of working on screen. On the other hand, I relish the exchange of energy between the actors and the audience in real time, when working on stage. In short, I have no preference. I want it all! Denzel Washington’s work has influenced me the most. I’ve always aspired to fill the leading man space in the Asian American acting community the way that Denzel carved one out for himself in the African American community and inspired young black actors to pursue their dreams as well. My plans for this year are mostly centered around two projects that coincidentally both involve family themes. First, I’m hoping to help bring “Benny and Joon” one step closer to a full production run on Broadway. I’m aware there are many factors in order for that to realistically happen, but it is a beautiful piece about siblings that is incredibly touching. And later this year, I’m looking forward to premiering an independent movie musical, I acted in last year called “Nanay Ko”. It’s a story about a daughter who returns home after a family tragedy, and has to decide if she will abandon her dream to help them out. With any luck, it will find some success and a distributor on the festival circuit. Can you tell us more about your role in Benny and Joon? My favorite emoji is the Winking Face With Tongue, mainly because it captures my essence. From Emojipedia: “…Often conveys a sense of fun, excitement, wackiness…” I can also mimic it pretty well, with the left eye winking however. What do you think is the biggest difference between UK and US acting industry? The biggest difference between the UK and the US acting industry is in their size and scope. Case in point, while the US has a city where its sole existence is in service to the entertainment industry- Los Angeles- hubs for major TV and movie studios have also been established in New York, North Carolina, Georgia, Texas, and New Mexico. And while the UK does have studios in London and Glasgow, they also have access to epic locations in the rest of Europe, Africa, and Iceland. What has been your experience as an ethnic minority actor? My acting experience as an ethnic minority can best be described as being blessed. Not only have I been able to play roles that might be typically expected given my ethnic background- i.e. Filipino, American, Japanese, Chinese, and even Latino. I have also been non-traditionally cast in roles that would be usually played by a Caucasian actor. The best example of this was playing The Prince in the “Cinderella” movie musical produced by Disney for ABC starring opposite Brandy, and with Whitney Houston. To this day, I’m still approached by people who say how impactful it was to see an actor of color play that role and how it deeply affected their viewpoint on what was possible in the world. I am truly grateful to have made that small contribution as an artist. It was an absolute pleasure chatting with you, Paolo! If you’d like to ask him some more questions please use the comments section below.